How does this drawer attach to the desk? The small half-circle drawer can be screwed into your desktop so that it is flush with the desk edge. 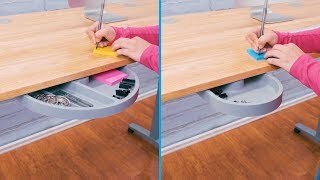 This allows it to rotate out for access to the contents of the drawer, and back underneath your desk for easy storage. Can I install this drawer on an Eco curve? Yes, you can. You may just need to recess the drawer to ensure that it remains fully hidden while closed. Do you have a larger drawer if I need more space? Yes! If you like the small half-circle drawer but think you need more space, our Half-Circle Drawer features a few extra inches of storage space to hold your pens, glasses, and smaller notepads. Can I have the desk drawer and the keyboard tray on the same desk? Yes, you can even if you have a smaller desktop! The half circle drawer is flush to the desk, while the tray can lower beneath it. Can I install two of these drawers on the same desk? As long as you have the space, you can install multiple drawers. Contact us if you're unsure and we will give you some guidance. This compact little drawer comes in your choice of black, gray, or white color options to suit your office and personal style.